In our region on the Poitou-Charentes we have still had no rain to speak of for weeks. The ground is like concrete and those horses with thin soles or arthritic joints are probably having a bit of a hard time right now more than most. Whether your equines are shod or not, you may find that you are needing to call the farrier out sooner than normal because cracks and splits have started to appear. When there is no moisture in the ground the very dry horn of the hoof causes cracks to appear because the hoof looses its flexibility. The hoof receives a lot of concussion when hitting the ground and you should take this into account when exercising or competing when the ground conditions are this bad. 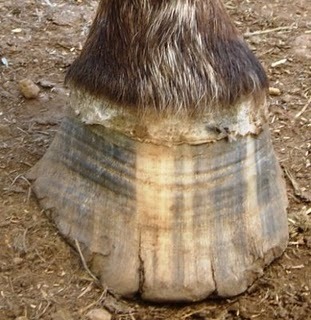 Not only can the hoof be damaged but also the legs, joints and muscles. In the ‘old days’ it was common practice just to keep oiling the hooves when the ground was hard and dry. In fact what hoof oil does do is stop moisture entering into the hoof wall, which is exactly what we don’t want. There are plenty of good alternatives to hoof oil on the market now – hoof treatments, conditioners and dressings which allow the hoof to breathe. Let us also not forget that the grass available to our four legged friends at the moment may have very little or no nutritional value left in it, so you may need to feed a supplement to help aid horn growth. And finally….let it rain soon! !